Mackenzie Foy stars as Clara, suffering through grief with her father and two siblings during their first holiday without her recently deceased mother, Marie. Clara receives an enigmatic and ornate Christmas gift, the last from her mother, a metallic contraption shaped like an egg with an elaborate keyhole that came with no key that might fit accompanying it. She is despondent that she cannot open it without ruining it, and it causes her to be depressed during the big holiday gala put on by her godfather, Drosselmeyer (Morgan Freeman). who, it turns out, had created the egg for her mother. 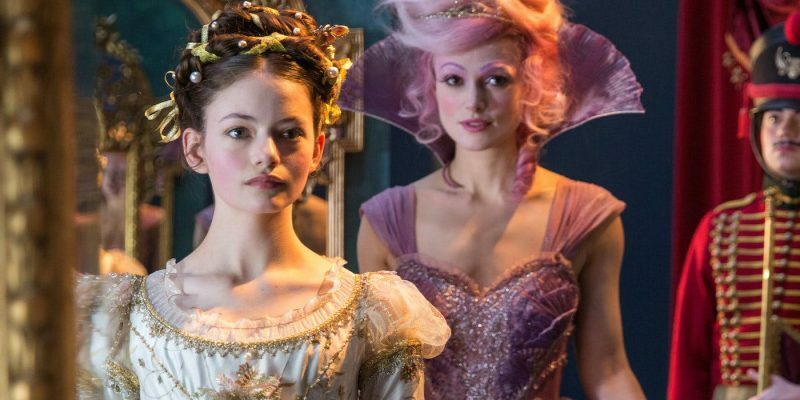 During the events of the evening at Drosselmeyer’s mansion, she follows a string that will lead to Drosselmeyer’s own gift to her, way out from the party and into another dimension, to a mystical and magic-fueled world called the Four Realms.